Out at night on a winding country road. It‘s raining and, to make matters worse, the headlights from the driver behind you are blinding. This is unpleasant and may, at worst, lead to an accident. Modern headlights make nighttime driving safer by adjusting the light distribution to the current traffic situation: While they illuminate specific areas in a targeted fashion, they do not blind other road users. Researchers at the Fraunhofer Institute for Reliability and Microintegration IZM in Berlin have collaborated with Infineon, Osram, Hella and Daimler in the composite project μAFS to develop an adaptive front lighting system: „We have been able to solidly connect four LED chips having 256 pixel each with the driver electronics chip. Due to this high resolution, we can control the light distribution to the smallest detail,“ explains Dr. Hermann Oppermann, Group Manager in the Department of Wafer Level System Integration at the IZM. The headlight allows permanent high beam, blinds other road users less and makes it possible to alter the light distribution according to need: such as the course of the road, the oncoming traffic as well as the distance and position in relation to other road users. Only the pixels which are needed at the moment are turned on. This is usually only around 30 percent of the total available light output of the entire system, so it is very energy efficient, since light is generated on the light source only where it is needed in the traffic area. The LED chips are currently installed in headlights. The experts from the IZM were responsible in the project for establishing contact between the individual pixels and the driver chip in order to be able to control each point of light independently. With a pixel size of only 125 microns, that is not an easy task: „The connections have to be sturdy, and we need good thermal contact to ensure sufficient cooling of the chip,“ Oppermann explains. The Berlin researchers are pursuing two different approaches: In the first variant, a gold-tin alloy is applied in a pattern onto the chip. The technology is well established in the field of optoelectronics. Such fine grid structures with intermediate distances as small as 15 microns, as are required for the LED chip, have not previously been possible, though. In the second approach, the researchers are working with a gold nano-sponge. 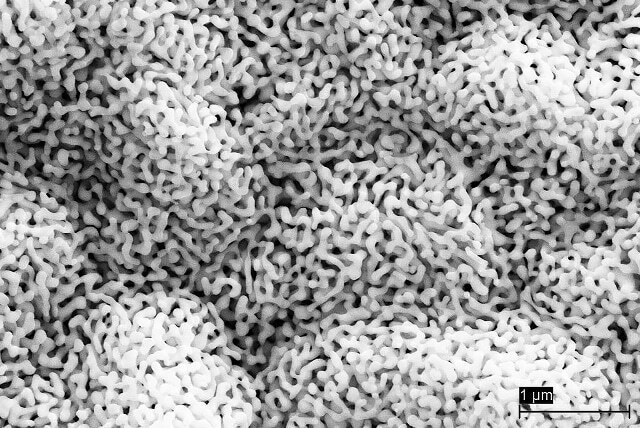 „This nanoporous gold structure has the advantage that it compresses like a real sponge and can be precisely adapted to the topography of the component,“ says Oppermann. A small unevenness of a few micrometers, which inevitably occurs, can therefore be compensated for easily and quickly. This is because previous solutions have drawbacks: LED lighting systems are relatively large and expensive: one LED is needed for each point of light. Today, up to 80 individual LEDs are commonly interconnected to form a system. In order to produce a coherent beam of light on the road, though, every LED has to have its own, precisely aligned optics. In another approach, the light source is a laser light or an LCD display with LED lighting, which fades areas of the light distribution according to the situation. Since light is produced and reabsorbed, this solution is not very energy efficient. The same applies to the method of shading certain areas by means of mechanical masks. In the latter system, moreover, only relatively large areas can be selectively illuminated and darkened.